Do you usually fly on a particular airline? Do you buy your coffee from the same place every morning? Do you recommend a specific restaurant whenever out-of-towners ask for suggestions? Well, there's a good reason for it. The reason we stay loyal to brands is because of their values. The best brands strive to combine physical, emotional, and logical elements into one exceptional customer (and employee) experience that you value as much as they do. 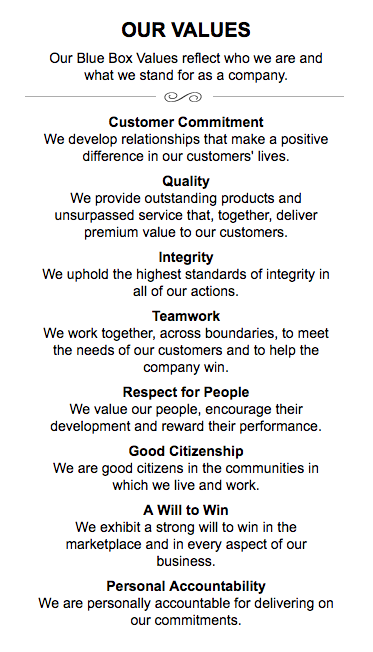 Nowhere are those values more visible than in the company's mission statement. That's where company vision and mission statements come in. Let's start with a bit of a vocabulary lesson to differentiate between these two types of company statements. A vision statement describes where the company aspires to be upon achieving its mission. This statement reveals the "where" of a business -- but not just where the company seeks to be. Rather, a vision statement describes where the company wants a community, or the world, to be as a result of the company's services. If the above examples are vision statements, what's a mission statement? A mission statement is, in some ways, an action-oriented vision statement, declaring the purpose an organization serves to its audience. That often includes a general description of the organization, its function, and its objectives. Ultimately, a mission statement is intended to clarify the "what," the "who," and the "why" of a company. It's the roadmap for the company's vision statement. As a company grows, its objectives and goals may be reached, and in turn they'll change. Therefore, mission and vision statements should be revised as needed to reflect the business's new culture as previous goals are met. Both mission and vision statements are often combined into one comprehensive "mission statement" to define the organization's reason for existing and its outlook for internal and external audiences -- like employees, partners, board members, consumers, and shareholders. With that in mind, what does a good mission statement look like? Check out some of the following company mission statements for yourself -- and get inspired to write one for your brand. Mission Statement Examples Life is Good: To spread the power of optimism. sweetgreen: To inspire healthier communities by connecting people to real food. Patagonia: Build the best product, cause no unnecessary harm, use business to inspire and implement solutions to the environmental crisis. American Express: We work hard every day to make American Express the world's most respected service brand. Warby Parker: To offer designer eyewear at a revolutionary price, while leading the way for socially conscious businesses. InvisionApp: Question Assumptions. Think Deeply. Iterate as a Lifestyle. Details, Details. Design is Everywhere. Integrity. Honest Tea: To create and promote great-tasting, healthy, organic beverages. IKEA: To create a better everyday life for the many people. Nordstrom: To give customers the most compelling shopping experience possible. Cradles to Crayons: Provides children from birth through age 12, living in homeless or low-income situations, with the essential items they need to thrive – at home, at school and at play. 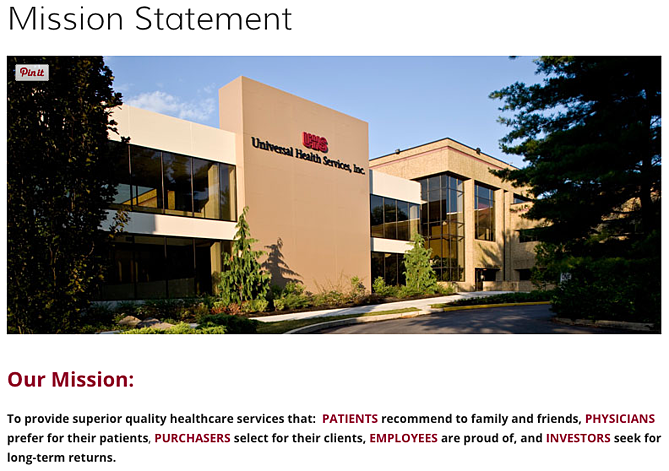 Universal Health Services, Inc.: To provide superior quality healthcare services that: PATIENTS recommend to family and friends, PHYSICIANS prefer for their patients, PURCHASERS select for their clients, EMPLOYEES are proud of, and INVESTORS seek for long-term returns. JetBlue: To inspire humanity – both in the air and on the ground. Workday: To put people at the center of enterprise software. Prezi: To reinvent how people share knowledge, tell stories, and inspire their audiences to act. Tesla: To accelerate the world's transition to sustainable energy. Invisible Children: To end violence and exploitation facing our world's most isolated and vulnerable communities. TED: Spread ideas. Best Vision and Mission Statement Examples From Real Companies 1. Life Is Good: To spread the power of optimism. The Life is Good brand is about more than spreading optimism -- although, with uplifting T-shirt slogans like "Seas The Day" and "Forecast: Mostly Sunny," it's hard not to crack a smile. There are a ton of T-shirt companies in the world, but Life is Good's mission sets itself apart with a mission statement goes beyond fun clothing: to spread the power of optimism. This mission is perhaps a little unexpected if you're not familiar with the company's public charity: How will a T-shirt company help spread optimism? Life is Good answers that question below the fold, where what the mission means is explained in more detail, with links to programs implemented to support it: its #GrowTheGood initiative and the Life is Good Kids Foundation page. We really like how lofty yet specific this mission statement is -- it's a hard-to-balance combination. Notice that sweetgreen's mission is positioned to align with your values -- not just written as something the brand believes. We love the inclusive language used in its statement, letting us know that the company is all about connecting its growing network of farmers growing healthy, local ingredients with us -- the customer -- because we're the ones who want more locally grown, healthy food options. The mission to connect people is what makes this statement so strong. And that promise has gone beyond sweetgreen's website and walls of its food shops: The team has made strides in the communities where it's opened stores as well. Primarily, it provides education to young kids on healthy eating, fitness, sustainability, and where food comes from. The sweetlife music festival attracts 20,000 like-minded people every year who come together to listen to music, eat healthy food, and give back to a cause -- the sweetgreen in schools charity partner, FoodCorps. Patagonia's mission statement combines both the values that bring them market success (building safe, high-quality products) and the values that contribute to a better world (philanthropic efforts to help the environment). For the people behind the brand, "a love of wild and beautiful places demands participation in the fight to save them." In the name of this cause, the company donates time, services, and at least 1% of its sales to hundreds of grassroots environmental groups around the world. 4. American Express: We work hard every day to make American Express the world's most respected service brand. The tweet above is from Simon Sinek, and it's one that we repeat here at HubSpot all the time. American Express sets itself apart from other credit card companies in its list of values, with an ode to great customer service, which is something it’s famous for. Speaking of quirky, this "objective" statement from Warby Parker uses words that reflect a young and daring personality: "rebellious," "revolutionary," "socially-conscious." In one sentence, the brand takes us back to the root of why it was founded while also revealing its vision for a better future. The longer-form version of the mission reads: "We believe that buying glasses should be easy and fun. It should leave you happy and good-looking, with money in your pocket," which further shows how Warby Parker doesn't hold back on letting its unique personality shine through. 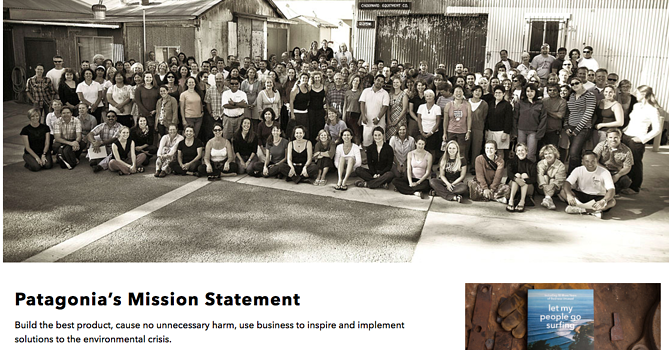 Here, the missions statement's success all comes down to spot-on word choice. These days, it can seem like every B2B company page looks the same -- but InvisionApp has one of the cooler company pages I've seen. Scroll down to "Our Core Values," and hover your mouse over any of the icons, and you'll find a short-but-sweet piece of the overall company mission under each icon. We love the way the statements are laid out under each icon. Each description is brief, authentic, and business babble-free -- which makes the folks at InvisionApp seem like trustworthy, B.S.-free types. Honest Tea's mission statement begins with a simple punch line connoting its tea is real, pure, and therefore not full of artificial chemicals. The brand is speaking to an audience that's tired of finding ingredients in its tea that can't be pronounced, and have been searching for a tea that's exactly what it says it is. Not only does Honest Tea have a punny name, but it also centers its mission around the clever company name. For some time, the company even published a Mission Report each year in an effort to be "transparent about our business practices and live up to our mission to seek to create and promote great-tasting, healthier, organic beverages." The folks at IKEA dream big. 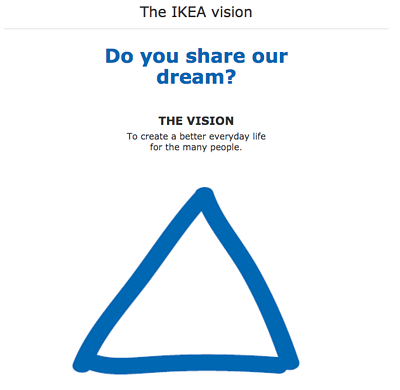 The vision-based mission statement could have been one of beautiful, affordable furniture, but instead, it's to make everyday life better for its customers. It's a partnership: IKEA finds deals all over the world and buys in bulk, then we choose the furniture and pick it up at a self-service warehouse. "Our business idea supports this vision ... so [that] as many people as possible will be able to afford them," the brand states. Using words like "as many people as possible" makes a huge company like IKEA much more accessible and appealing to customers. 9. Nordstrom: "To give customers the most compelling shopping experience possible. 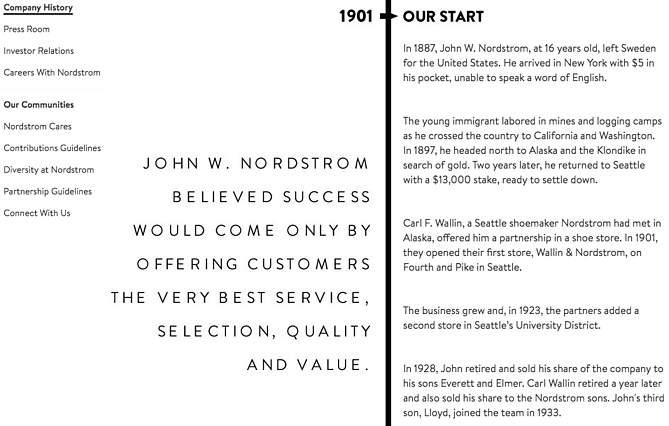 When it comes to customer commitment, not many companies are as hyper-focused as Nordstrom is. Although clothing selection, quality, and value all have a place in the company's mission statement, it’s crystal clear that it’s all about the customer: "Nordstrom works relentlessly to give customers the most compelling shopping experience possible." If you've ever shopped at a Nordstrom, you'll know the brand will uphold the high standard for customer service mentioned in its mission statement, as associates are always roaming the sales floors, asking customers whether they've been helped, and doing everything they can to make the shopping experience a memorable one. 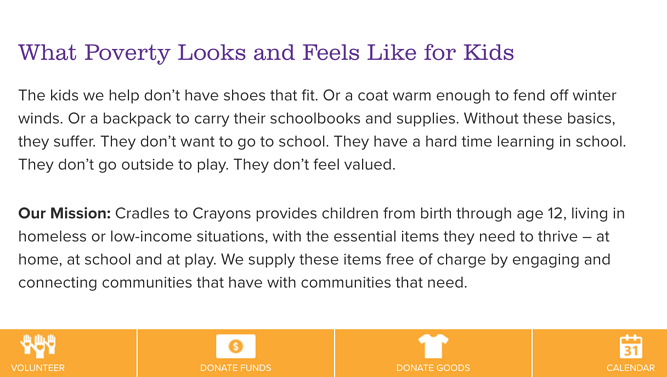 Cradles to Crayons divided its mission and model into three sections that read like a game plan: The Need, The Mission, and The Model. The "rule of three" is a powerful rhetorical device called a tricolon that's usually used in speechwriting to help make an idea more memorable. A tricolon is a series of three parallel elements of roughly the same length -- think "I came; I saw; I conquered." A company thrives when it pleases its customers, its employees, its partners, and its investors -- and Universal Health Services endeavors to do just that, according to its mission statement. As a health care service, it specifically strives to please its patients, physicians, purchasers, employees, and investors. We love the emphasis on each facet of the organization, by capitalizing the font and making it red for easy skimming. JetBlue's committed to its founding mission through lovable marketing, charitable partnerships, and influential programs -- and we love the approachable language used to describe these endeavors. For example, the brand writes how it "set out in 2000 to bring humanity back to the skies." For those of us who want to learn more about any of its specific efforts, JetBlue's provided details on the Soar With Reading program, its partnership with KaBOOM!, the JetBlue Foundation, environmental and social reporting, and so on. It breaks down all these initiatives really well with big headers, bullet points, pictures, and links to other webpages visitors can click to learn more. Finally, it ends with a call-to-action encouraging website visitors volunteer or donate their TrueBlue points. Workday, a human resources (HR) task automation service, doesn't use its mission statement to highlight the features of its product or how it intends to help HR professionals improve in such-and-such a way. Instead, the business takes a stance on the state of enterprise software in general: There's a lot of great tech out there. But at Workday, it revolves around the people. We love how confident yet kind this mission statement is. It observes the state of its industry -- which Workday believes lacks a human touch -- and builds company values around it. 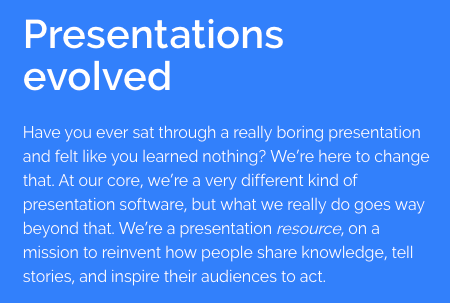 If you know Prezi, you know how engaging it can make your next business presentation look. According to its mission statement, the company's clever slide animations and 3-dimensional experience aren't just superficial product features. With every decision Prezi makes, it's all about the story you tell and the audience that story affects. 15. Tesla: To accelerate the world's transition to sustainable energy. A car company's punny use of the word "accelerate" is just one reason this mission statement sticks out. The main reason Tesla makes this list is because of how its mission statement describes the industry. It may be a car company, but Tesla's main interest isn't just automobile sales -- it's promoting sustainable energy. And sustainable energy still has a "long road" ahead of it (pun intended) -- hence the world's "transition" into this market. Ultimately, a mission statement that can admit to the industry's immaturity is exactly what gets customers to root for it. And Tesla does that nicely. 16. Invisible Children: To end violence and exploitation facing our world's most isolated and vulnerable communities. Tenacity is hard to come by in the non-profit sector, and that's what makes this mission statement so distinguished. Invisible Children is a non-profit that raises awareness around the violence affecting communities across Central Africa, and the company takes quite a confident tone in its mission. The most valuable quality of this mission statement is that it has an end goal. Many companies' visions and missions are intentionally left open-ended so that the business might always be needed by the community. Invisible Children, on the other hand, wants to "end" the violence facing African families. It's an admirable mission that all businesses -- not just non-profits -- can learn from when trying to motivate their customers. We've all seen TED Talks online before. Well, the company happens to have one of the most succinct mission statements out there. TED, which stands for "Technology Education and Design," has a two-word mission statement that shines through in every Talk you've seen the company publish on the internet. That mission statement: "Spread ideas." Sometimes, the best way to get an audience to remember you is to zoom out as far as your business's vision can go. What do you really care about? TED has recorded some of the most famous presentations in the world, but in the grand scheme of things, all it wants is to spread ideas around to its viewers.